Red is a hot, attention-demanding color, which helps create interiors, which, whether liked or not, simply cannot go unnoticed. Some people claim it is aggressive and overwhelming. However, red is definitely a bold and powerful, to say at least. In different countries and cultures, red is associated with good luck, happiness, and prosperity in China to joy in Singapore to mourning in South Africa. Nowadays, color psychologists assert that red denotes power, passion, energy, excitement, masculinity, and love, but also anger and revenge. Red can be stimulating and friendly, but also demanding and aggressive. However, how people perceive one color or another or how it affects their emotions, is entirely a matter of individuality. The truth is that red and its variations- maroon, burgundy, crimson, and scarlet, is definitely a make-a-statement, dramatic, energetic color. 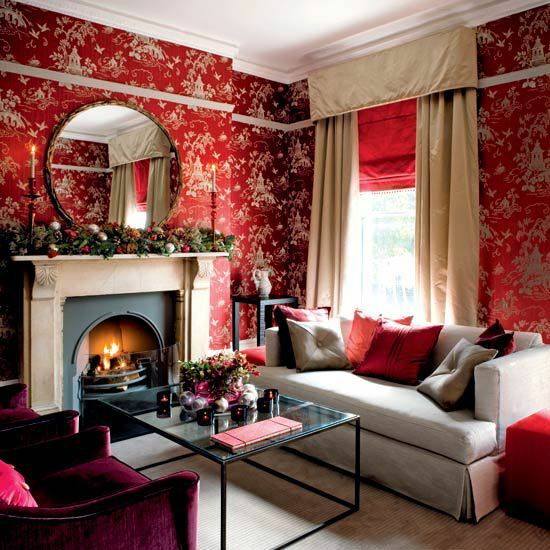 Whether you like it or not, as red is one of the colors universally associated with Christmas and Santa Claus, you add some pops of red to your living space each year at least for the holiday season. Being an intense, energetic color, red is usually balanced by white and neutrals. 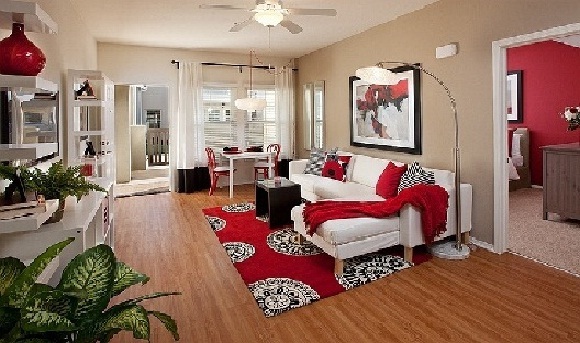 Actually, red and white make a pleasing color combo, which can lend any space a timeless look. Bright red/or replaced by a muted hue/ works well with black and white to make a color trio with unbeatable charm and appeal. Above, a contemporary living room in red, black, and white. Tastefully done, this space is elegant and sophisticated. A white sofa, an area rug and a piece of wall art in red, black, and white, some red accents…An eye-grabbing floor lamp adds extra light and visual interest. Potted plants bring in freshness. Definitely a timeless look! Sometimes, color choices and finishes lend a completely different look to the classic red-black-and-white combo and take it to another level. 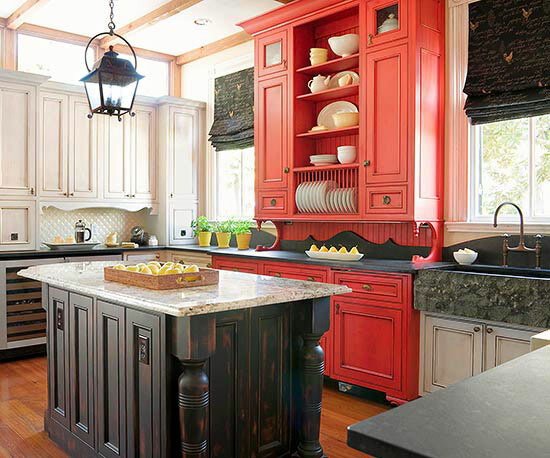 In the above-shown cottage kitchen, a coral red built-in hutch definitely stands out. An aged island and a pair of Roman shades add black to the color scheme. Glazed upper cabinetry and dark flooring add warmth to the space. Displayed tableware, potted herbs, and fruit arrangements bring in visual interest and freshness. Another popular, favorite color trio is the red-blue-and-white décor combo. Whether in patterned wallpaper, rugs, curtains, and bedding or as accent furniture and walls, red works well with a number colors – from gray to orange and yellow to beige and green. 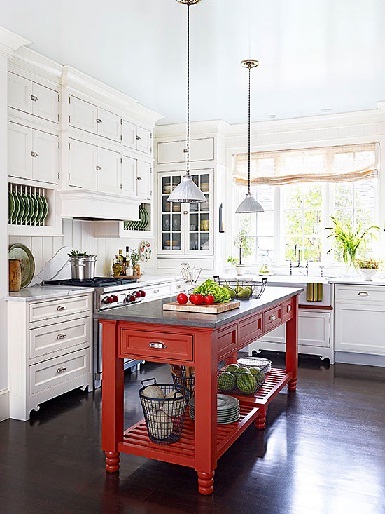 In the kitchen above, a red island definitely makes a bold statement against the white walls and creamy cabinetry. Dark flooring adds warmth to the space. Colorful accessories and flowers bring in visual interest and freshness. 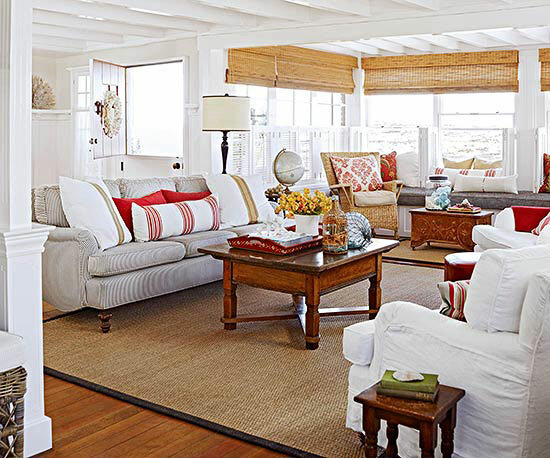 Above, a cozy, inviting beach-style living room. White walls, a sisal rug, blinds, and rattan chairs make a neutral backdrop for the pops of red. Wood tables and flooring add to the warmth, which this space exudes. A window nook brings in extra doses of charm. Stylish accessories and cut flowers add visual interest and freshness. Definitely a space with personality! Although red walls can be overwhelming, especially for small spaces, if you like the color and have decided to fully embrace it, some coats of paint or wallpaper can do the job. Above, a stairway in red. Although not entirely in red/and with a hint of pink/, this stairway shows how some red paint can add warmth to any space. 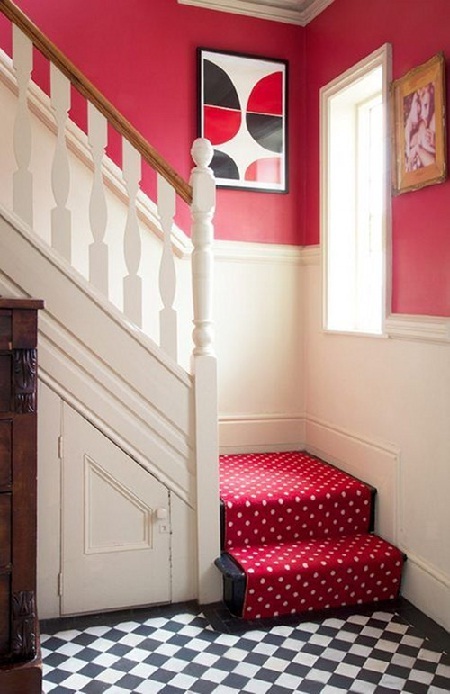 Here, a polka-dotted runner complements the half-red walls to create a sense of harmony. On the other hand, the black-and-white checkered floor balances this small space. Pieces of wall art add extra visual interest. Being a vibrant, too powerful color, red creates space with a stimulating rather than relaxing, soothing atmosphere and generally is not recommended for bedrooms. However, when done tastefully, with attention to detail, even a bedroom decorated fully in red can be a cozy, intimate, wow-worthy space! Above, a definitely bold bedroom. Although almost entirely in red, the space is elegant and sophisticated, with distinctive touches of luxury. A stunning black four-poster bed immediately grabs the eye. Thoughtfully positioned floor and table lamps help create a romantic atmosphere. Wood flooring adds to the warmth and coziness, which this room exudes. Simply a magnificent space! Note that if you choose a wallpaper option, a possible solution to soften the effect of red is to use a wallpaper pattern with hints of a more neutral color, anything from taupe to green to gold can do the job. Above, a living room decorated for Christmas. 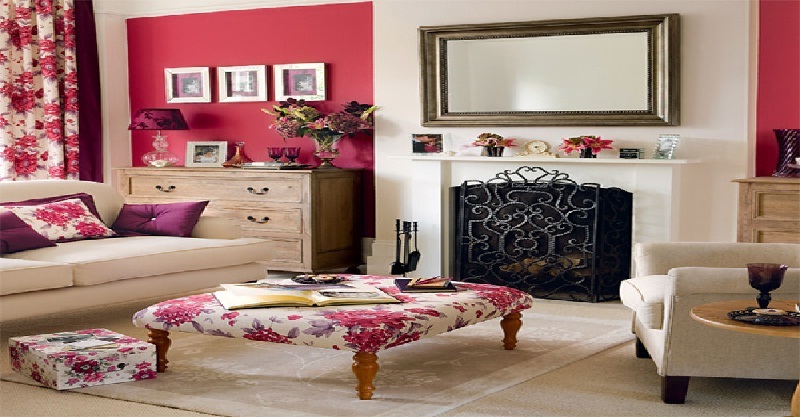 Red wallpaper complemented by other décor items is red help create a warm, inviting feel. Creams and whites balance the space. Candles and holiday décor add sparkle and touches of festivity. What a charming room! As already mentioned, red is an attention-grabbing color and this makes it an amazing option for accent walls. So, if you want to add touches of real drama, always consider red. 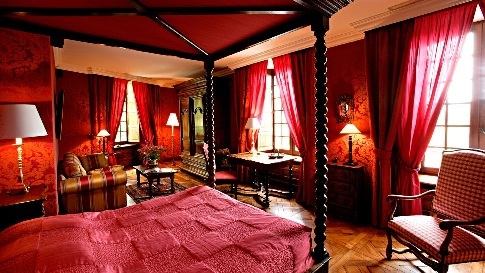 In the picture above, a bold ceiling in red adds to the romantic atmosphere in this bedroom. The space shows how well reds and greens work together to create spaces with charm and personality. A drum-shaped lighting fixture brings in extra visual interest. A variety of patterns and textures lends the space an appealing, layered look. Actually, as red is associated with love and romance, accents in red – from drapery, upholstery, and throw pillows to quilts and table and floor lamps to even something as simple as a bouquet of red roses can help add touches of charm and romance and elements of luxury and create a truly exciting bedroom. Note that red is a popular option for front doors and sports areas. Also, as it denotes positivism, boldness, and opulence, whether used as a dominant color, for accent walls, or for smaller-scale accents, red is a fabulous choice for entries, dining rooms, and living rooms. Generally, bright red is a fabulous color for details/pieces of furniture or gorgeous accessories/ you want to get noticed, so using a saturated hue for making bold, dramatic statements is a popular décor solution. In light-colored spaces, such accents definitely stand out against the background of white or cream walls. Décor items in black, gray, or blue can be added to achieve a timeless, classic look. However, it all depends entirely on anyone’s taste and preference as well as on the architectural character of the space. Above, a charming bathroom. 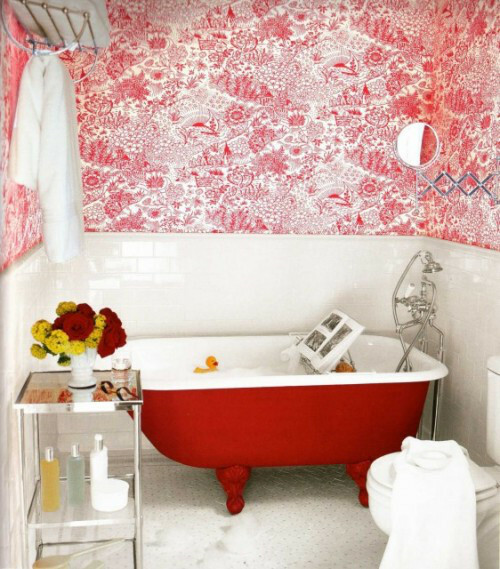 A stunning red bathtub complements walls in red Toile wallpaper. A vase of flowers on top of a side table adds extra color and freshness. Definitely a fascinating space! Red is an intense color, which evokes an array of emotions. Some people find it too bold, energetic, and even aggressive and provocative, others like the way it adds touches of drama, passion, romance, glamor, and luxury to their living spaces. However, whether used as a dominant color choice, in color combos with white, black, green, or blue in different proportions, for accent walls, or sparingly for accent décor items, it immediately changes the atmosphere in the room. Red in all its variations always draws attention and helps create exciting, unique interiors. You are not sure about using red in your home? Then, try with small doses at first, throw pillows and small yet stylish accessories are always an affordable, easy, and surefire way for experiments. If you are among those you definitely do not like this color, simply do not use it even for small accents. After all, there are so many other colors to choose from!